It remains a little known fact that the famous British composer and conductor , Benjamin Britten, was smitten by the Jensen Interceptor. Obviously, we are talking here of the original Jensen Interceptor of the 1950s. 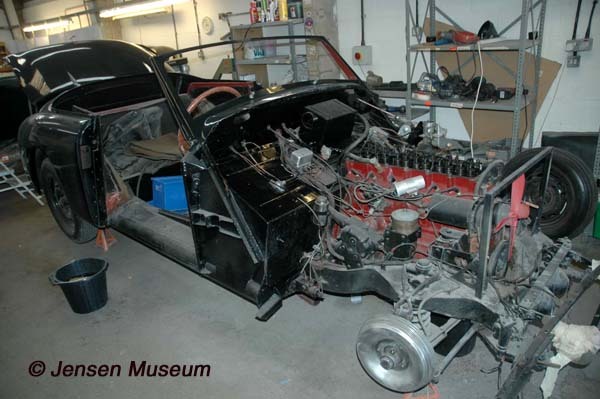 Britten purchased his black Interceptor Cabriolet in June 1957, and it is believed kept the car until 1963. 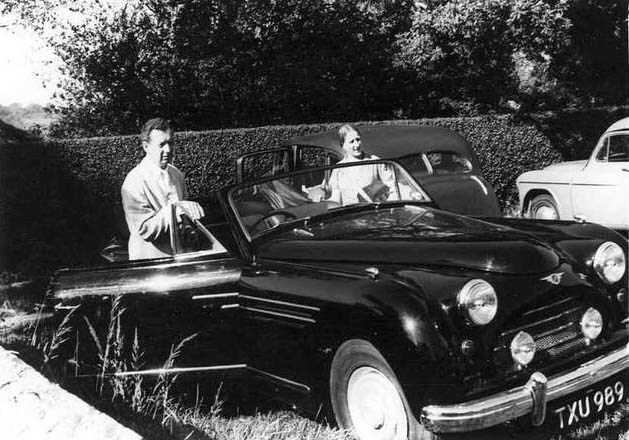 The Museum looks at the history of this famous composer, and his car, and hopes further information might be found relating to its early history. First registered 1st June 1957. Britten was born in the fishing port of Lowestoft in Suffolk, on 22nd November 1913. Born into a middle class family, his father, Robert, was a dentist, and his mother, Edith, was a talented musician. When Britten was seven, he was sent to a dame school, run by Miss Astle. The younger sister, Ethel, gave him piano lessons. In later life, Britten said that he remained grateful for the excellence of her teaching. The following year he moved on to prep school, South Lodge, Lowestoft, as a day boy. 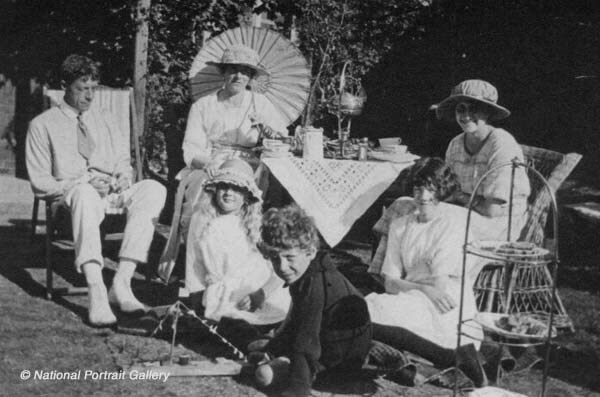 The Britten family, with Robert and Edith Britten, their daughter Beth, and son, Benjamin. Taking afternoon tea in the garden with family friends. Photograph taken circa 1920. The school had no musical tradition, and Britten continued to study the piano with Ethel Astle. From the age of ten Britten took viola lessons from a friend of his mother, Audrey Alston, who had been a professional player before her marriage. In his spare time he composed prolifically. Britten’s hard work paid off, and in 1930, he won a composition scholarship at the Royal College of Music in London. His examiners were the composers, John Ireland and Ralph Vaughan Williams, along with the college’s harmony and counterpoint teacher, S P Waddington. In the three years from 1935 to 1937, Britten wrote nearly 40 scores for the theatre, cinema and radio. Film music of the late 1930s included, Matthews singles out, Night Mail and Love from a Stranger (1937). For the theatre, there was The Ascent of F6 (1936), On the Frontier (1938) and Johnson Over Jordan (1939). Music for the radio included, King Arthur (1937) and The Sword in the Stone (1939). In 1937 there were two events of huge importance in Britten’s life: his mother died, and he met the tenor Peter Pears. Both Britten and Pears were homosexual, and it wasn’t long before a life long relationship began. By April 1939 Britten and Pears sailed to North America, going first to Canada and then to New York. They had several reasons for leaving England, but primarily it was the difficult position of pacifists in Great Britain at that time (both Britten and Pears being pacifists). Add to this various hostile and belittling reviews of Britten’s music in the English press. When the Second World War began, Britten and Pears turned for advice to the British embassy in Washington, and were told that they should remain in the US as artistic ambassadors. Pears was inclined to disregard the advice and go back to England; Britten also felt the urge to return, but accepted the embassy’s counsel and persuaded Pears to do the same. However, Britten longed to return to Great Britain. During 1942, the two men decided to leave the USA and return home. Once back, Britten and Pears applied for recognition as conscientious objectors. Britten was initially allowed only non-combatant service in the military, but on appeal he gained unconditional exemption. After the death of his mother in 1937 Britten had used money she bequeathed him to buy the Old Mill in Snape, Suffolk, which became his country home. He spent much of his time there in 1944 working on the opera Peter Grimes. The Aldeburgh Festival was launched in June 1948, with Britten, Pears and Crozier directing it. Imogen Holst, the only daughter of the composer, Gustav Holst, visited the festival, and added her own contributions. Pears, who had observed Holst’s musical contributions, believed she could help Britten and the Aldeburgh Festival on a more formal basis. Shortly after the 1952 festival, Britten invited Holst to come and work with him. Believing Britten to be a great composer, Holst immediately agreed, and in September 1952 moved to lodgings in Aldeburgh. Once in Aldeburgh, Holst worked as Britten’s musical assistant, and also helped with the organisation of the annual Aldeburgh Festival. In 1956 she became joint artistic director of the festival, and during the following 20 years helped it to a position of pre-eminence in British musical life (in 1964 she gave up her work as Britten’s assistant, and started composing in her on right). At the beginning of the 1950s, the fervently anti-homosexual Home Secretary, David Maxwell Fyfe, urged the police to enforce laws making homosexual acts illegal. Britten and Pears came under scrutiny; Britten was visited by police officers in 1953 and was so perturbed that he discussed with his assistant, Imogen Holst, the possibility that Pears might have to enter into a sham marriage. Although in the end it did not take place. Britten had just finished The Prince of the Pagodas, for The Royal Ballet in 1957, and in the same year moved from their house on the seafront at Aldeburgh, to a larger property on the outskirts of town. The house was called the Red House, simply due to the red brick that it was built from. 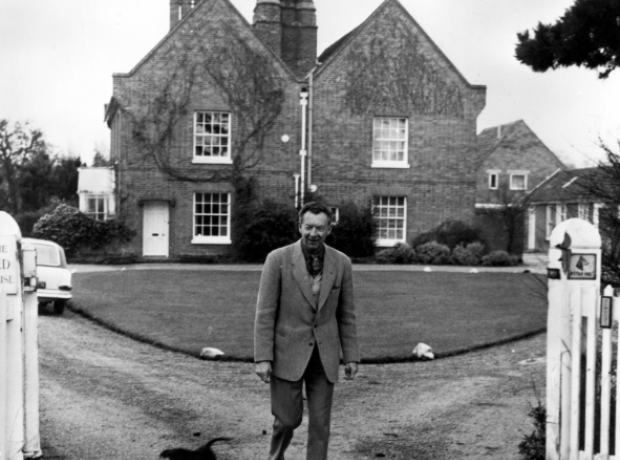 Benjamin Britten photographed by the gates to the Red House. He purchased the house in 1957, and bought an Interceptor during the same year. 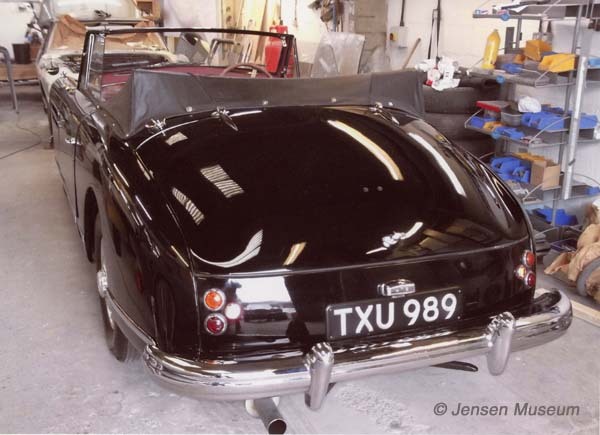 In addition to the house move, Britten also purchased a black Jensen Interceptor cabriolet in 1957, from the well known Bentley and Jensen dealers in London, Brooklands of Bond Street. 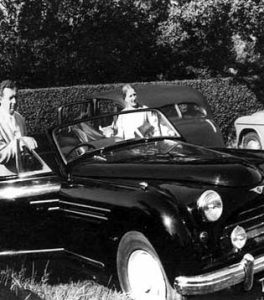 Benjamin Britten and Imogen Holst about to go for a drive in TXU 989. Photograph taken in 1958. 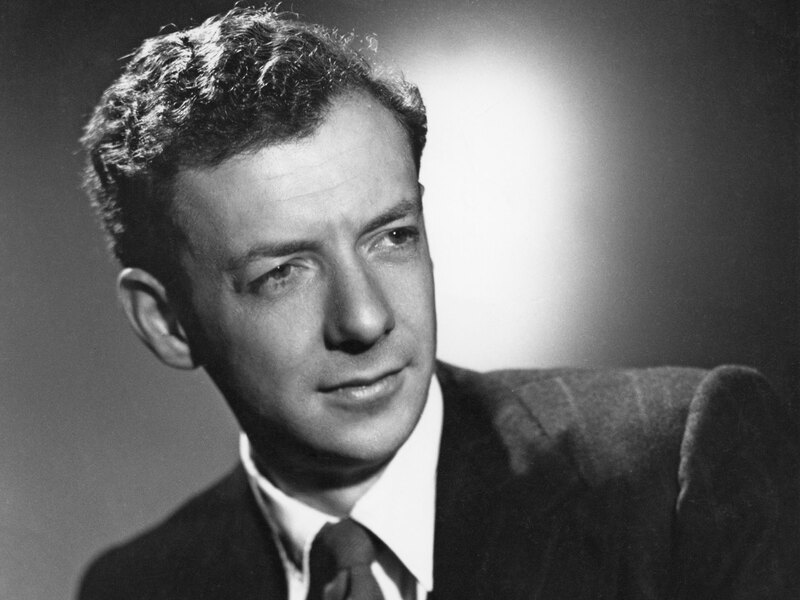 One of the best known of Britten’s works, the War Requiem, was premiered in 1962. Britten decided that this work would commemorate the dead of both World Wars in a large-scale score for soloists, chorus, chamber ensemble and orchestra. By the time the War Requiem had been premiered, Britten was looking to change cars. 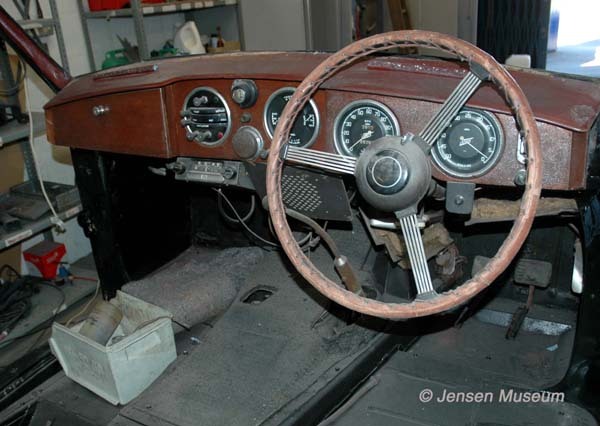 The Jensen Interceptor, that he had owned since 1957, would be disposed of. 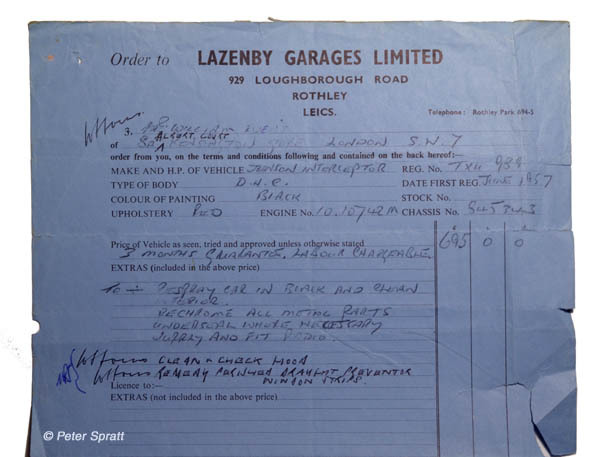 Britten is believed to have disposed of the Interceptor in early 1963, possibly part-exchanging the car with Lazenby Garages Ltd in Rothley, Liecestershire. Born in 1934, Chartered Surveyer, William Ivens, had seen the Interceptor advertised, and travelled to Rothley to view the car in June of 1963. He was pleased with what he saw, and agreed in principle to purchase. However, there were caveats. 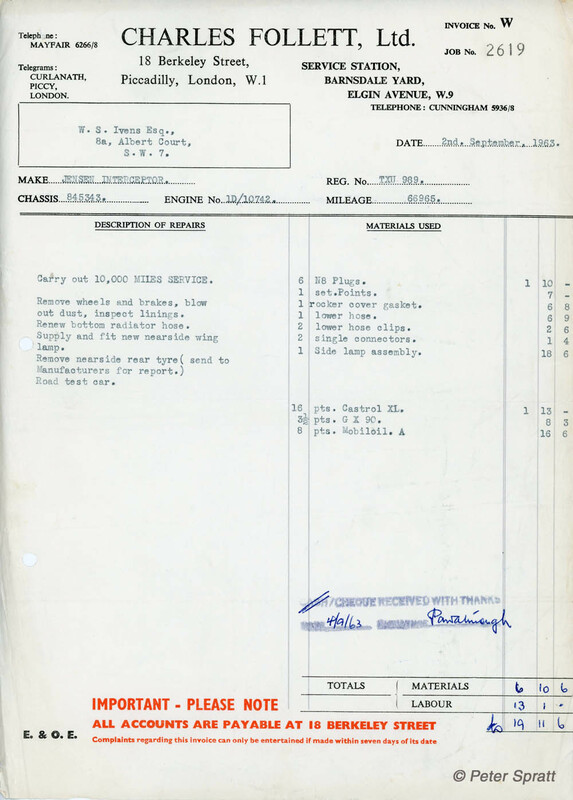 Sales receipt for TXU 989 given to Ivens by Lazenby Garages Ltd.
Lazenby Garages required about a month to complete the respray and various other work, and by the middle of July the car was ready. 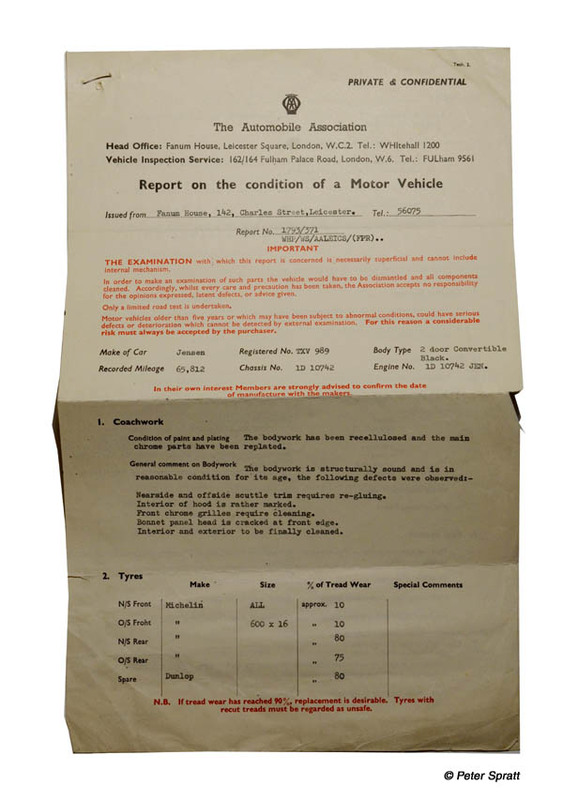 The AA condition report undertaken on TXU 989. Ivens was happy, paid Lazenby Garages the £695, and received the old style registration book (now lost, a document dated 10.5.2010 from Ivens to classic car restorer, Peter Stait, mentions, “The car’s history is unique, but please note that I would need to search for the original log book which is of course signed by the late Benjamin Britten.”). Ivens also received an MOT certificate issued on 10th April 1963 from D.F.Booth Ltd, Ripon. 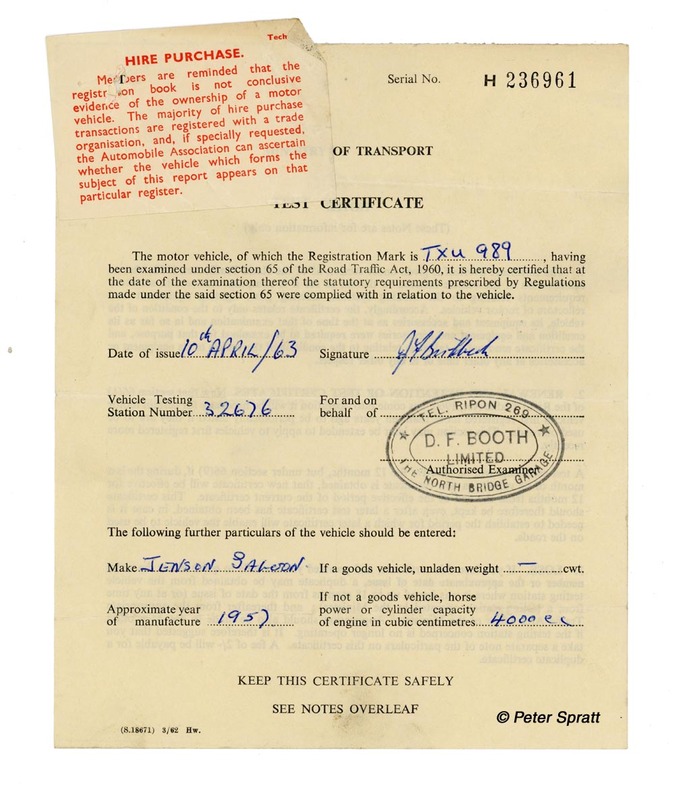 The MOT certificate running from April 1963, given to Ivens when he purchased the Interceptor. If Ivens was given anything else isn’t known. Certainly no further documentation, such as MOT certificates (earlier than 1963), or other documents relating to the time Britten owned the car,exists in the car’s history file today. 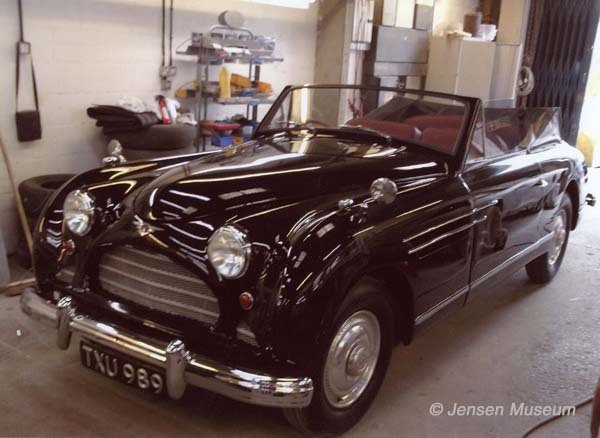 We know Ivens wasn’t given the original instruction / handbook, as a letter was sent from Ivens to Jensen Motors in August 1963, asking if they could supply him with one, and also to ask if there was a recommended company in the London area to service the car. The Service Manager, Tom Killeen, replied swiftly, to say this book was now out of print, and that Charles Follett were the recommended company in London for any service work to Jensen cars. 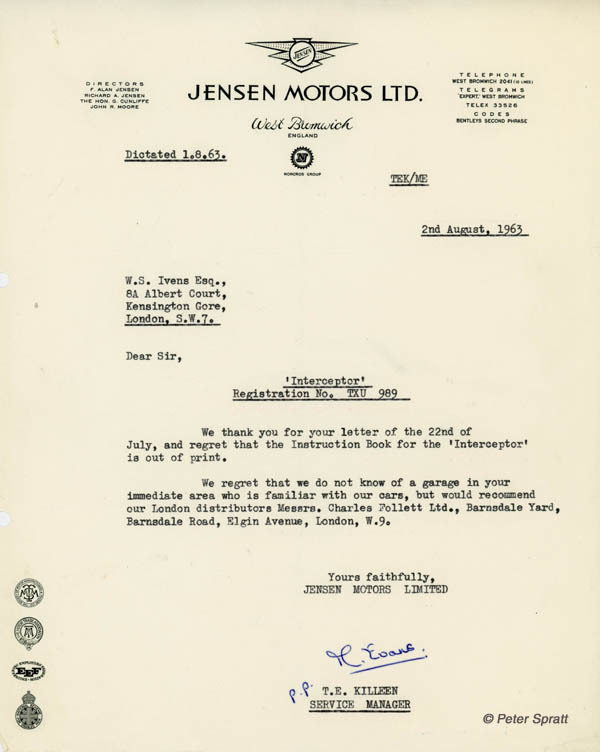 Letter from Jensen Motors to Ivens, stating the Jensen Interceptor handbook was out of print. Killeen’s recommendation was taken up by Ivens, and in September 1963, TXU 989 is left with Folletts for a full service. Iven’s has already been using the Interceptor on a regular basis. Charels Follett give a mileage reading of 66,965 when the car comes into them. Charles Follett invoice from September 1963. By the end of the same month, TXU 989 is back with Folletts. Ivens has dented the front nearside wing, and wants the car repaired. By 1965, Ivens had purchased a property in Hove, Sussex (although documents in the car’s history file show that Ivens retained a London residence on as well). A Hove-based company, Brittans, which was owned by Caffyns undertook a couple of service requirements for Ivens (Caffyns would later become Jensen distributors). 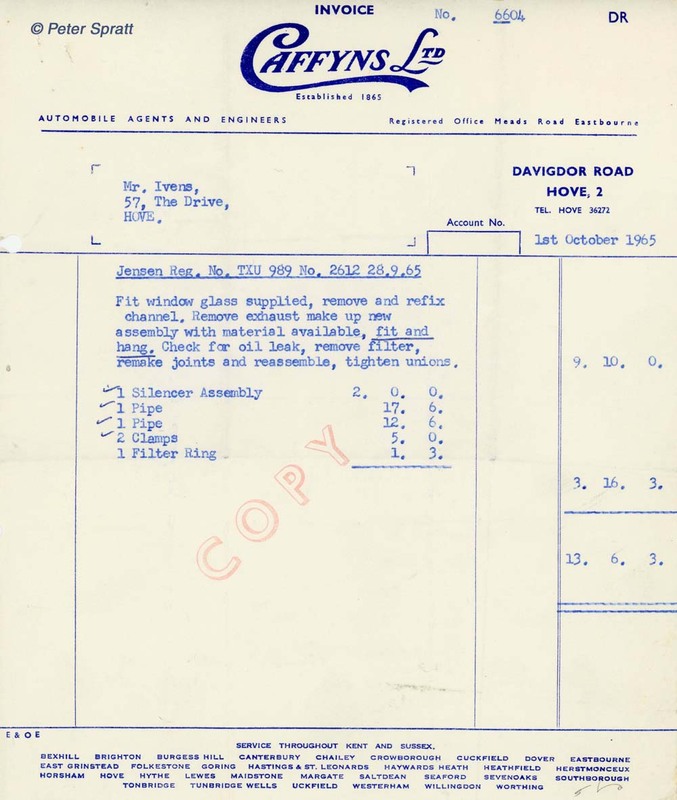 Caffyns invoice dating from October 1965. Caffyns would later become official Jensen dealers. Other more mundane bits of work to TXU 989 was completed by one of the small garages situated in a mews at the back of London’s Kensington area. As Ivens said goodbye to the swinging sixties, and moved into the seventies, TXU 989 remained his everyday car. With the change of decades, TXU 989 had covered over 85,000 miles from new. In September 1971, Ivens took TXU 989 to the Donald Healey Motor Company based in Warwick. Unfortunately we do not know why Ivens took the car there, and it was certainly a fair drive from where he was living. The Donald Healey Motor Company undertook a fair amount of work. The exhaust system was changed and the braking system was overhauled. 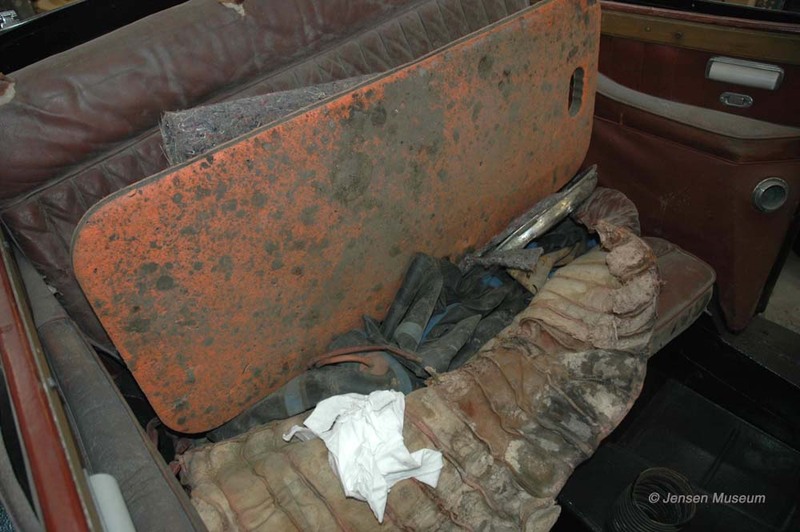 The car had covered 87,050 miles when Ivens was invoiced for the work. 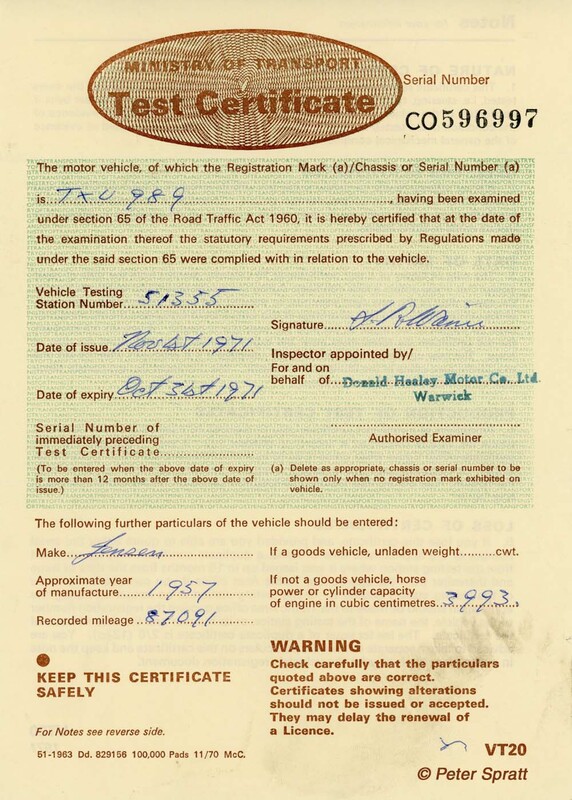 MOT test certificate dating from 1971. During the early to middle 1970s, Ivens purchased Woodlands, an idyllic estate just outside of Ascot. By this time, TXU 989 was in semi-retirement. A Mercedes-Benz had been purchased, and this car did the majority of miles. TXU 989’s semi-retirement is confirmed by the history file documentation, which shows that in five years, the car had covered less than 500 miles. The seventies moved into the eighties, and by 1981, TXU 989 had covered just 100 miles since 1976. This lack of use would eventually have a nasty sting in its tail. Ivens had not been taxing the car regularly and failed to insure the registration number TXU 989 was maintained onto computer records at Swansea. The outcome was Ivens finding out that when he came to tax the car in 1985, that the DVLA were not willing to allocate the original registration number back onto the car. 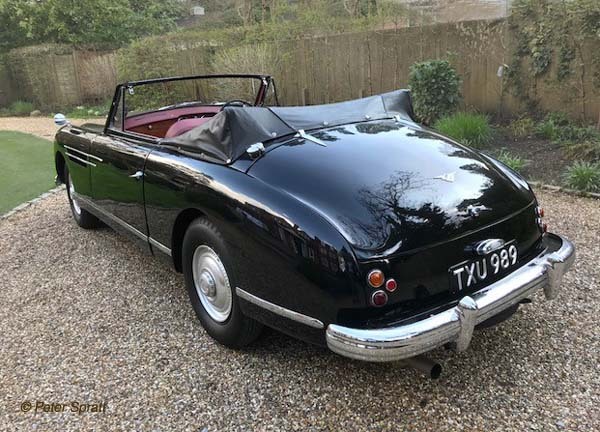 This started a copious amount of paperwork between Ivens, the DVLA, the Jensen Owners’ Club, and the classic car auctioneers, Coys of Kensington. The DVLA had made it clear to Ivens the only grounds they would permit him to have his original registration number back, is if he could prove the car was of historical interest. It was nearly two years later on 7th December 1987, that Ivens was eventually allowed to retain the TXU 989 registration number. It took formal letters from the Jensen Owners’ Club, Coys of Kensington, and even Jensen Cars Ltd, all stating the Jensen Interceptor was a particularly rare car and the original registration was integral to the car’s history and integrity, before the DVLA finally conceded. 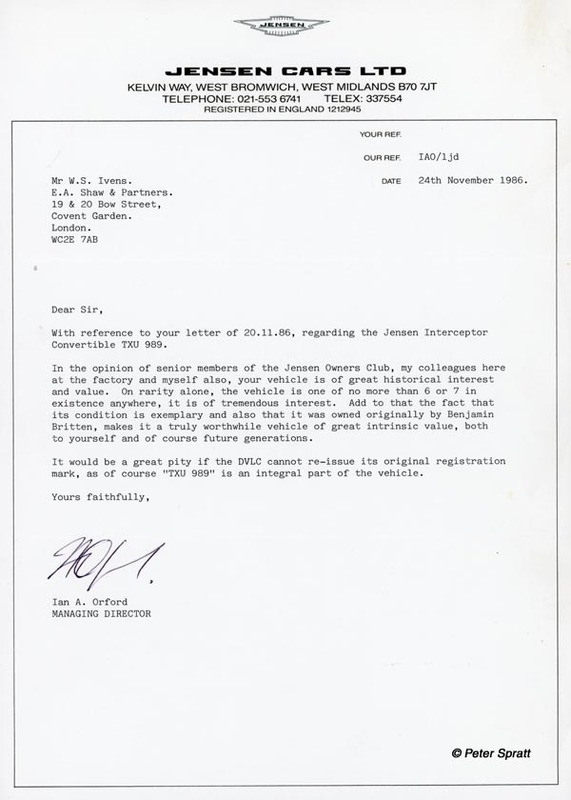 Letter from Ian Orford of Jensen Cars Ltd, stating that TXU 989 was an historical car, worthy of retaining its original registration number. Even although Ivens now had the TXU 989 registration number back in place, the days of using the Interceptor had passed. The car was put through an MOT in 1981, and the next one was 1984, with the car showing a mileage of 88 075. After which, the car was left in one of Iven’s barns on his Woodlands estate. 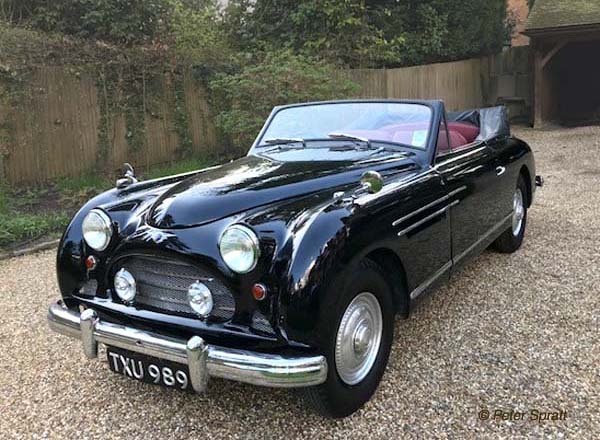 “After the telephone call, it was agreed that I would travel down to Windelsham [near Ascot] in Surrey to collect the Interceptor, and transport it back to my bodyshop in Redditch. We found Mr.Ivens’ property easy enough, but when we arrived we were confronted with a very large set of black iron gates which were locked. I telephoned Mr.Ivens from the van, and he said he would come and open the gates. After about ten minutes, this tall, elderly, rather eccentric looking chap came down to the gates on a pushbike. He opened up and asked us to follow him up a long wooded drive. Towards the end of the drive we could see a smallish rather down-at-heel bungalow coming into view. I had been expecting some sort of large mansion, so it was a bit of a shock. TXU 989 was collected from Surrey and brought back to Stait’s premises at Redditch. According to Stait, the car had survived in good overall condition. The chassis was sound, and most of the aluminium panelwork remained in good order. Although there was some amount of corrosion to the lower part of the front wings, and the engine was seized. An interior view of TXU 989 showing the dashboard. An interior view of TXU 989, photographed not long after Stait had brought the car to his workshop for inspection. The black rubber seat pumps can be seen where the seat covers have been pulled back. These are now archived in the Jensen Museum collection. Ivens accepted Stait’s quote for work, which then duly started. Initial stage payments were forthcoming, but by August 2006 another payment was due. Suddenly, Ivens was not replying to Stait’s letters, and after a year without any payment, Stait was forced to start legal proceedings. Stait won the case, and was paid for all work undertaken to that time. He was also asked by Ivens’ solicitors, that if he was paid an additional £1000 up front, would he continue work on the car. Stait agreed. With the additional £1000 paid, Stait restarted work on the Interceptor. Incredibly, once the £1000 had been used up in man hours, Stait found that once again, no further payments were forthcoming. 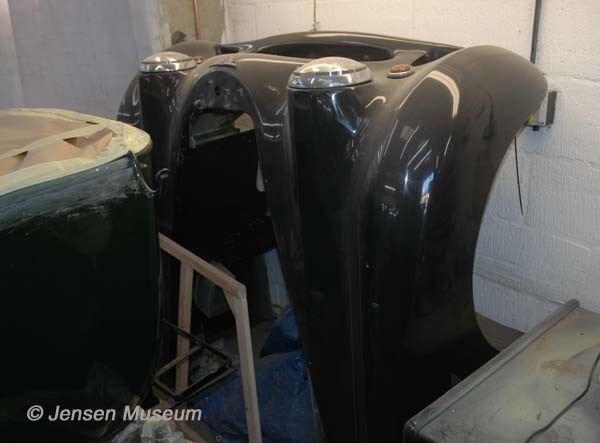 The complete front end of TXU 989, re-sprayed black and ready to fit back to the car. General mechanical refurbishing of TXU 989. Starting legal proceedings a second time around, Stait was contacted by John Cooke of Sunningdale Motors based in Windelsham. They serviced Ivens Mercedes-Benz, and had been asked by Ivens if they would buy the Interceptor, and settle payment with Stait. The company agreed, and then contacted Stait to say they now owned the car. Sunningdale Motors paid Stait up to date, and asked that he would continue work on the Interceptor, to bring it up to a presentable condition. To that end, Stait was asked to also have the bumpers chromed, and to have the car re-trimmed, along with the fitting of a new hood. With fresh, up-front financing from Sunningdale Motors, Stait continued to finish work to TXU 989. By 2011 the Interceptor was collected by Sunningdale Motors, who then placed the car up for sale. TXU 989 photographed from the rear. The car was purchased by Peter Spratt from Ascot in Surrey. Today , the car remains under the enthusiastic ownership of Spratt. TXU 989 photographed by Peter Spratt during April 2018. Rear view of TXU 989 photographed by Peter Spratt during April 2018.